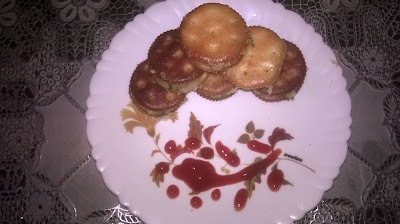 Biscuit sand-witch pakaura is tea time recipe. We can serve this is as a starter also. Biscuit sandwich pakaura is a very delicious recipe to treat your family and friends. Its all time kids favorite. I have prepared always for my son in evening snacks. He is love to take in their school lunch box, and I am sure this dish help you in packing your kids lunch box also. It is very simple and easy to make recipe. It can be prepared within 10-15 min. Peel the boiled potatoes. Mash the potatoes when they are still warm.